Fort Clatsop lies on the banks of the Lewis and Clark River, which enters Youngs Bay downstream of Astoria, Oregon. 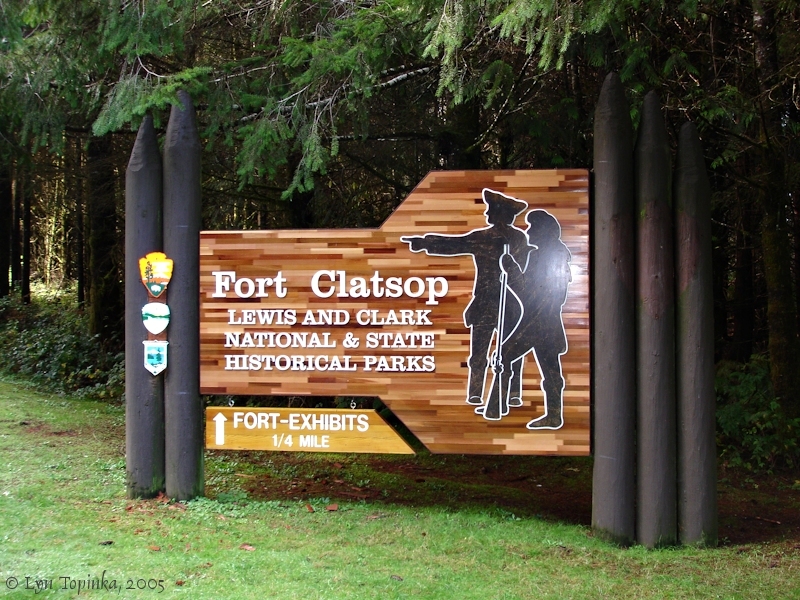 The Lewis and Clark expedition occupied the Fort Clatsop site from December 7, 1805, until March 23, 1806, when they left Fort Clatsop to begin their journey back home. In 1955 a replica fort was built to mark the 150-year anniversary of the Lewis and Clark expedition. 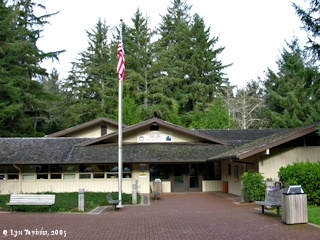 In 1958 the Oregon Historical Society donated the site of the fort to the Federal Government and it became part of the National Park System as the Fort Clatsop National Memorial. In 1966 Fort Clatsop National Memorial was added to the National Register of Historic Places (Building #66000640). 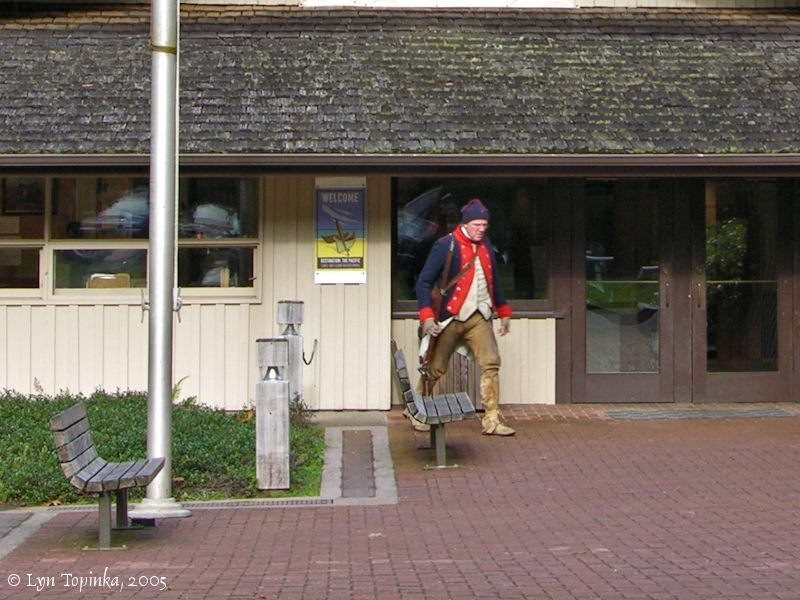 In 2004 Fort Clatsop National Memorial became part of the Lewis and Clark National and State Historical Parks, a grouping of sites important in the Lewis and Clark story. 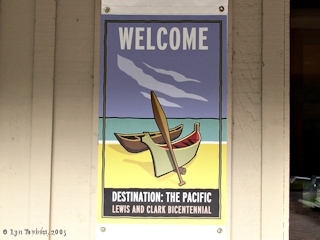 Click image to enlarge Sign, Fort Clatsop, Lewis and Clark National and State Historical Parks, Washington/Oregon. Image taken November 15, 2005. The Lewis and Clark expedition began building their winter quarters, which they named "Fort Clatsop", on December 10, 1805. The 33-member expedition moved in on Christmas day, where they would remain until March 23, 1806. They named their seven-cabin 50 x 50 foot home "Fort Clatsop" to honor the friendly Indian tribe that occupied the southern bank of the Columbia River at its mouth. On March 23, 1806, the men left Fort Clatsop to begin their journey back home. That first day they journeyed as far as Mill Creek, on the upstream side of Tongue Point. 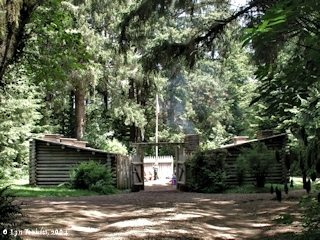 Click image to enlarge Fort Clatsop, Fort Clatsop National Memorial. Image taken May 25, 2004. Fort Clatsop, built by Lewis and Clark in December, 1805 for use as winter quarters, was situated eight-tenths of a mile south of this point. The site was chosen because of the game in the surrounding country and because it was convenient to the coast where salt could be made for the journey of the exploration party back to the Missouri. Elk were found in abundance and salt was made at what is now Seaside. The local Indians were friendly but it was disappointing that no trading vessels entered the river during the stay. After enduring a wet and sotrmy winter the party left the Fort on March 23, 1806 and took up its "Homeward Bound Journey." Source: Information Sign near Fort Clatsop, visited May 2004. Click image to enlarge Fort Clatsop Information Sign. Image taken May 25, 2004. Fort Clatsop is located on the Lewis and Clark River, two miles upstream from the junction of the Lewis and Clark with the Columbia River. Click image to enlarge Lewis and Clark River at Canoe Landing, Fort Clatsop, Oregon. Image taken May 25, 2004. Approximately 200 yards from Fort Clatsop on the Lewis and Clark River is Lewis and Clark's "Canoe Landing" site. 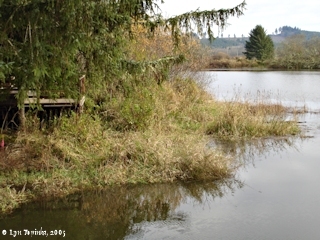 Now called Netul Landing, this site continued to be used long after Lewis and Clark had departed. 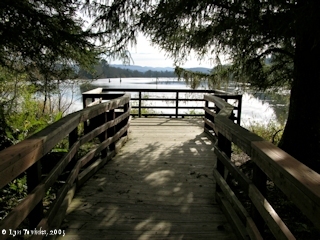 Click image to enlarge Viewpoint on the Lewis and Clark River, Canoe Landing, Fort Clatsop, Oregon. Image taken November 15, 2005. 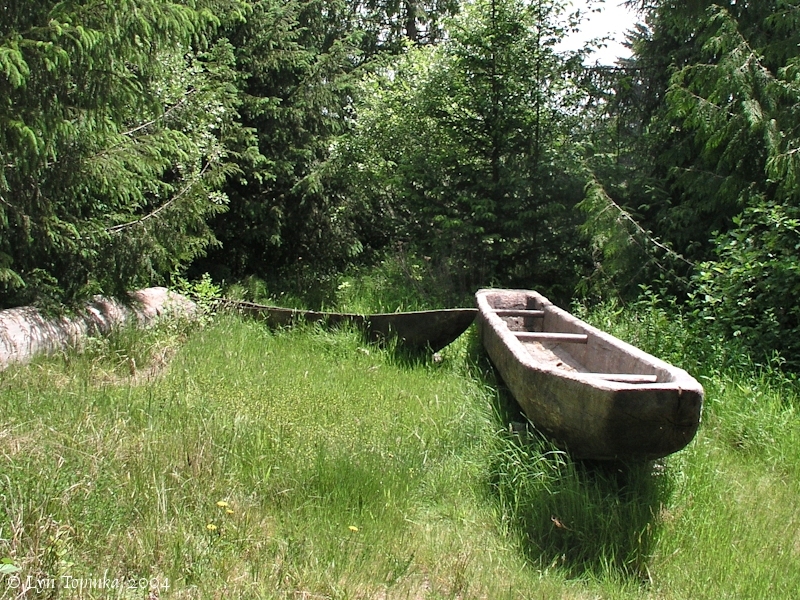 Click image to enlarge Fort Clatsop, Oregon, canoe, near Canoe Landing. Image taken May 25, 2004. Click image to enlarge Canoe, Canoe Landing, Fort Clatsop. Image taken May 25, 2004. 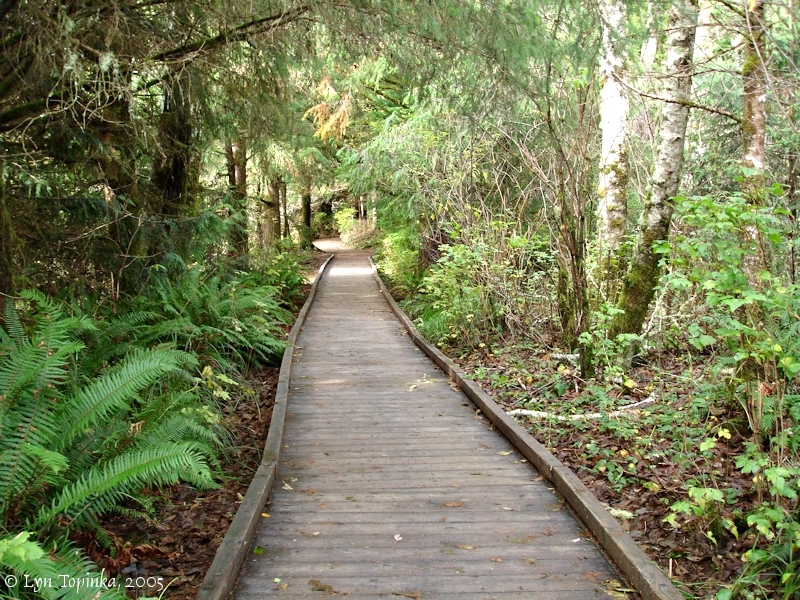 Two-hundred yards from Fort Clatsop to Canoe Landing, a boardwalk from Canoe Landing to Netul Landing, and the 6-mile "Fort to Sea" trail connecting Fort Clatsop with Sunset Beach on the Oregon coast. 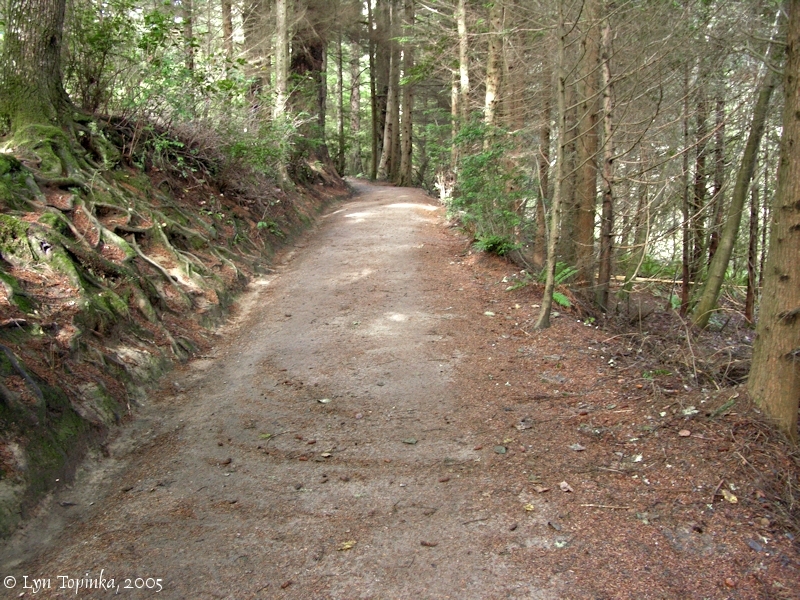 Click image to enlarge Trail to Canoe Landing, Fort Clatsop, Oregon. The 200 yards trail leads from the fort to the waters of the Lewis and Clark River. Image taken November 15, 2005. 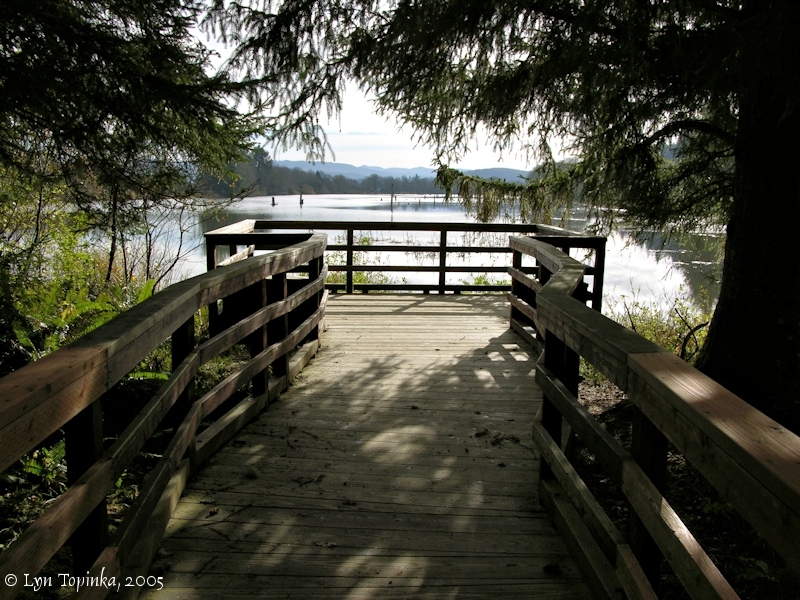 Click image to enlarge Boardwalk at Canoe Landing, Fort Clatsop, Oregon. Image taken November 15, 2005. 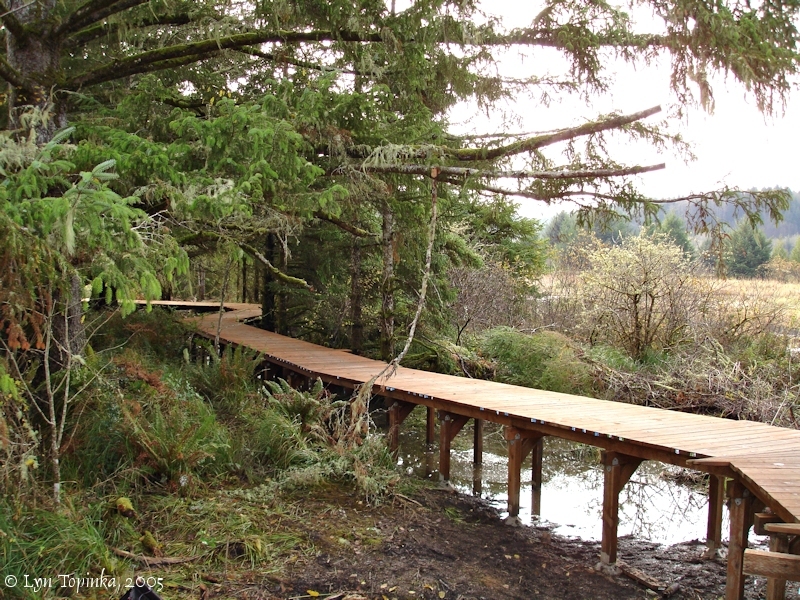 Click image to enlarge Boardwalk under construction, Canoe Landing to Netul Landing, Fort Clatsop, Oregon. Image taken November 15, 2005. "When the Corps of Discovery arrived at the Pacific, the expedition consisted of thirty-three people and one dog. Of the thirty-three, most were American frontiersmen or furtraders. A few were French-Canadian or other European descent. Toussaint Charbonneau and his American Indian wife, Sacagawea, were hired as interpreters for the expedition and were accompanied by their infant child. William Clark's African-American slave York was also a member of the expedition. After reaching the Pacific Ocean, the Corps voted to move up the Netul River (the present day Lewis and Clark River) to a camp site selected by Captain Lewis in early December, 1805. Work clearing the site for a fort began immediately. By December 10, the foundations for their rooms were laid and by December 14, they had finished the room walls and had begun roofing the meat house room. All roofing was completed by December 24 and the walls were daubed with mud. The captains moved into their room on December 23, the rest of the expedition moving in on Christmas Eve and Day. The rooms had bunks and puncheon floors. After Christmas, they installed interior chimneys in the living quarters and installed pickets and gates. 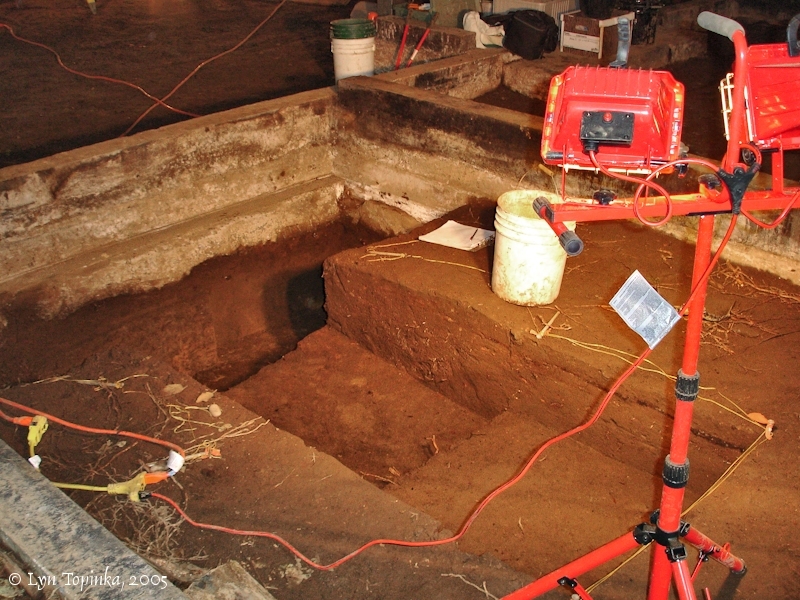 On December 31, they built a sentinel box and dug two "sinks." The journals do not give a detailed description of the fort. Expedition journals offer two floor plans, one drawn by Sergeant John Ordway and one by Captain William Clark. The two floor plans differ. Precedence has traditionally been given to Clark's documentation due to his rank and role in directing construction. By Clark's description, the fort was fifty feet square with two parallel cabins. One cabin contained 3 rooms, each with a central firepit, which were the enlisted men's quarters. The opposite cabin contained four rooms, two with firepits and one with a fireplace and exterior chimney. The orderly room, which had a firepit; the store room, which had a locking door; the room shared by the captains, which had a fireplace and exterior chimney; and the Charbonneau family room were all located on this side. Two gates were installed, one at each end of the parade ground. One was the main gate, which was locked at night. At the opposite end, the second gate was used to access the spring for water or other necessary trips outside the fort. 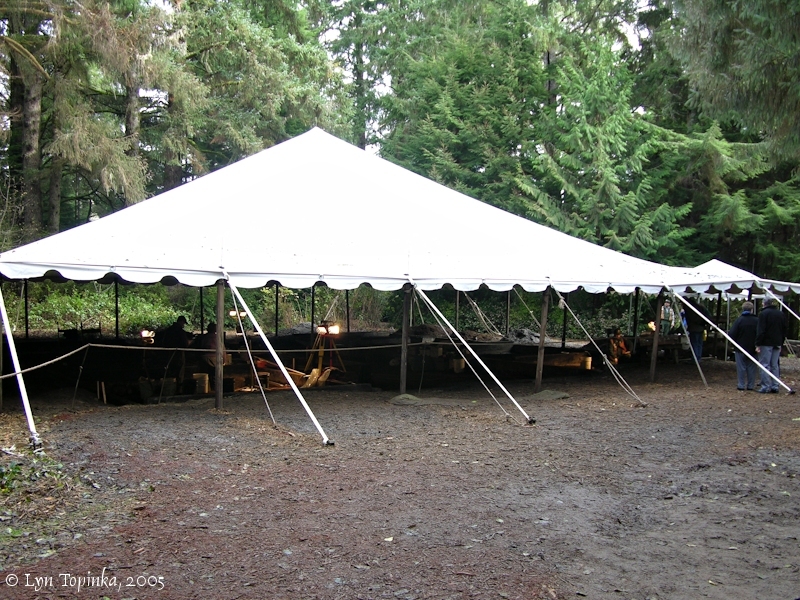 The expedition party stayed at Fort Clatsop until March 23, 1806, when they set out on their return journey." U.S. National Park Service, Fort Clatsop National Memorial, Administrative History, Chapter 2. "... On March 22, 1806, Lewis recorded in his journal the visit of Chief Comowool and three Clatsops. He states "to this Chief we left our houses and furniture." According to descendants of Comowool, he used the fort during hunting season for several years after the Expedition left. Beginning in 1811 with the arrival of John Jacob Astor's Pacific Fur Company and the establishment of the fur post at Fort Astoria, there is a record of visitation to the site by American and European traders, explorers, and settlers. On October 2, 1811, Gabriel Franchere, a member of the Pacific Fur Company, reported visiting the ruins of the fort and seeing only a pile of rough unhewn logs. A second trip was made by Ross Cox in May or June 1812. He noted that logs from the fort were still standing and marked with the names of several of the party. In 1813, after the outbreak of the War of 1812 and the loss of their annual trade ship, the Pacific Fur Company sold out to the North West Company. Fort Astoria was taken over by the British and renamed Fort George. In 1813, Alexander Henry of the North West Company and a captain of the British Royal Navy made a canoe trip to the site. At that time they found two Clatsop houses at the site, saw the remains of the fort and reported willows growing up inside the remains. They reported that the Clatsops had cut down and used a good portion of the wood from the fort walls. An 1821 Congressional report on settlement of the Oregon Country stated the fort remains could still be seen. Various other travelers and settlers took the time to visit the site and their documentation gives a record of the site's condition over time. In 1849, S.M. Henell of Astoria attempted to claim land containing the site of Fort Clatsop through a donation under an Oregon Provisional Government land claim law. The next year, however, Thomas Scott jumped Henell's claim under the federal 1850 Donation Act and shortly thereafter traded the property to Carlos Shane. Shane built a house a few feet from the remains of the fort. In 1852 or 1853, Carlos Shane's brother, Franklin Shane, moved to the site. Carlos Shane moved up river and transferred the site to Franklin. The claim consisted of approximately 320 acres along the west bank of the Lewis and Clark River, and included the fort site and the site along the river bank believed to be the Corps' canoe landing. In 1852, Richard Moore wanted to build a mill at the canoe landing site. An agreement was reached between Shane and Moore resulting in the movement of Shane's boundary slightly north so that Moore could claim the landing. Moore built a mill and from 1852 to 1854 the area around the mill was logged and lumber sent by boat from the canoe landing site to San Francisco. ..."
Source: U.S. National Park Service, Fort Clatsop National Memorial, 1995, Administrative History, Chapter 2. "... At 6.5 m. is the junction with a gravel road. Left here to the SITE OF FORT CLATSOP, 1.5 m., the winter encampment of the Lewis and Clark party in 1805-06. Now overgrown with evergreens, the site is designated by a flagpole and is marked by a plaque. ..."
In 1955 a replica fort was built to mark the 150-year anniversary of the Lewis and Clark expedition. In reconstructing the fort, the floor plan dimensions drawn by Clark on the elk hide cover of his field book were followed. 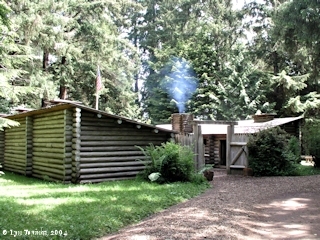 In 1958 the Oregon Historical Society donated the site of the fort to the Federal Government and it became part of the National Park System as the Fort Clatsop National Memorial. 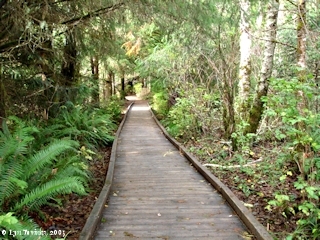 Fort Clatsop is located along the Lewis and Clark River, on the southwest end of Youngs Bay. 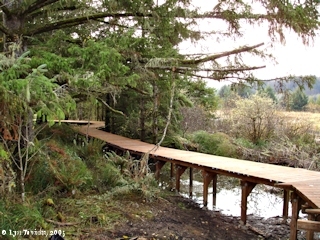 The site is 6 miles south of Astoria and 4 miles from the Pacific Ocean. Fort Clatsop National Memorial contains the replica of the Fort, a historic Canoe Landing site, and the "Salt Works", located 15 miles south in Seaside, Oregon. The Salt Works site was added to the memorial in 1979. 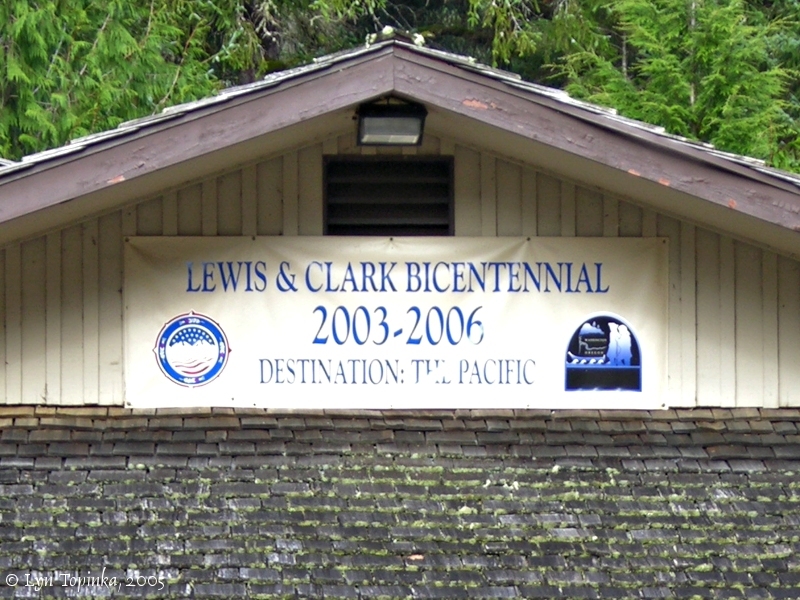 In 2005 for the Bicentennial, the Fort Clatsop National Memorial became part of the newly formed Lewis & Clark National Park, a grouping of historic Lewis and Clark areas on both sides of the Columbia River. Click image to enlarge Bicentennial sign, Visitor Center, Fort Clatsop, Lewis and Clark National Park. Image taken November 15, 2005. 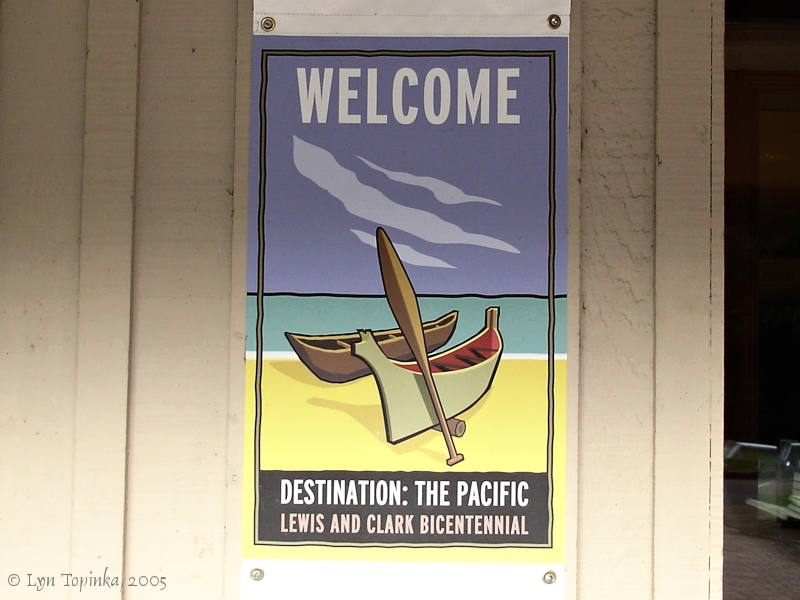 Click image to enlarge Bicentennial welcome sign, Visitor Center, Fort Clatsop, Lewis and Clark National Park. Image taken November 15, 2005. Click image to enlarge Visitor Center, Fort Clatsop, Lewis and Clark National Park. Image taken November 15, 2005. 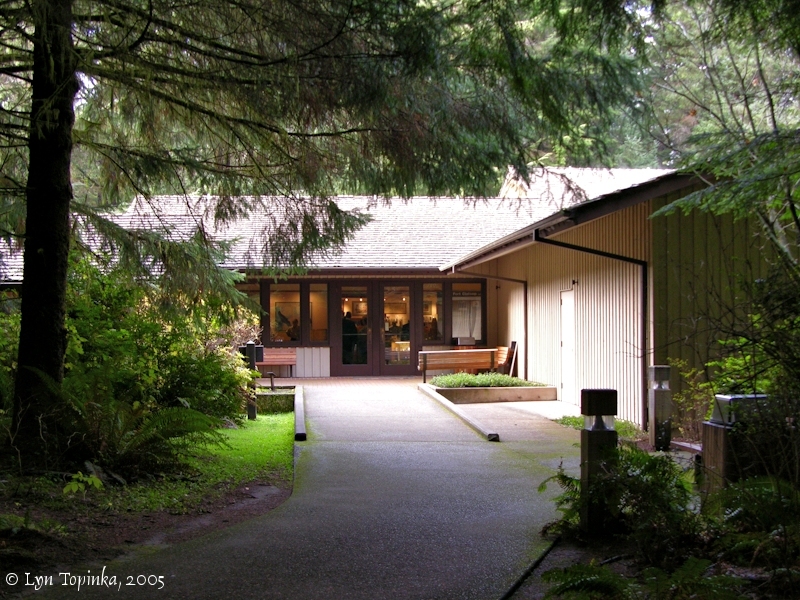 Click image to enlarge Back Entrance, Visitor Center, Fort Clatsop, Lewis and Clark National Park. Image taken November 15, 2005. 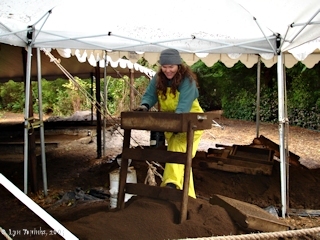 On October 3, 2005, the 50-year-old Fort Clatsop replica burnt to the ground. National Park archaeologists used this tragedy to spend 3 weeks digging beneath the foundations of the replica, looking for evidence of whether this was the true location of Fort Clatsop. 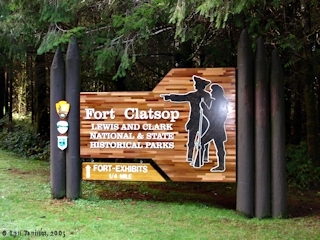 A new "Fort Clatsop" will be built on the same spot, with designs for construction to begin on December 10, 2005, exactly 200 years from the day men of the Corps of Discovery began building their Fort Clatsop. 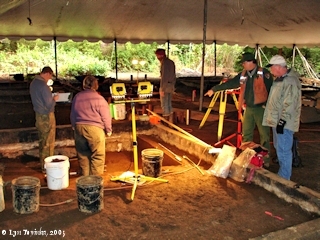 Click image to enlarge Archaeology Dig, Fort Clatsop, Lewis and Clark National Park. Image taken November 15, 2005. 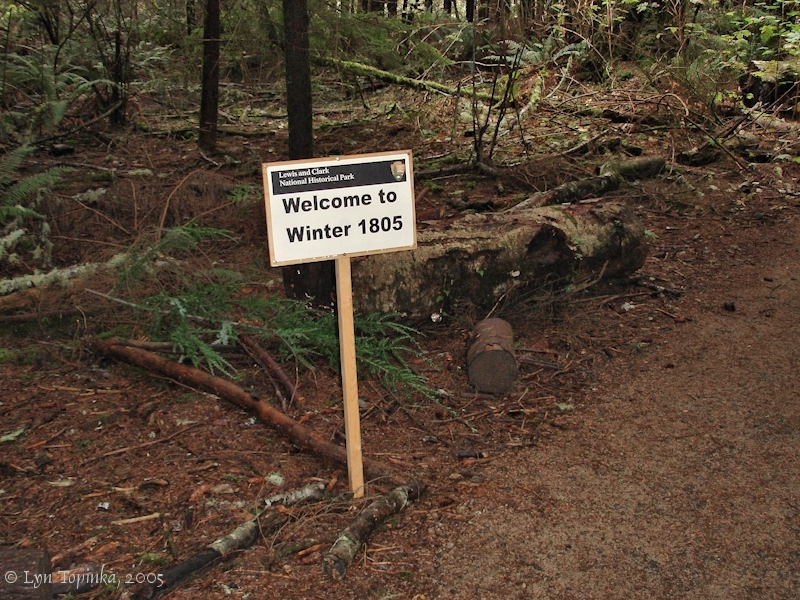 "Welcome to Winter 1805", a "Living History" event. Up and down the Columbia River in 2005 and 2006 Bicentennial Events were held, many of them with "reenactors" to bring the Lewis and Clark story to life. One such event was at Fort Clatsop, with a "Winter 1805" camp set up in the woods. 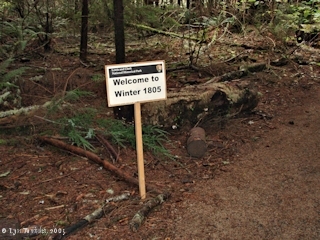 Click image to enlarge "Welcome to Winter 1805", Fort Clatsop. Image taken November 15, 2005. Click image to enlarge Seaman with the men, "Welcome to Winter 1805", Fort Clatsop. 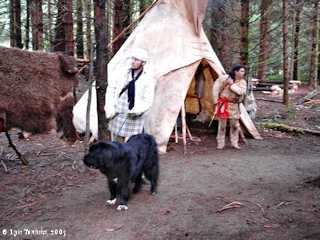 A buffalo hide tepee is in the background. Image taken November 15, 2005. Excerpt from Ross Cox, "Adventures on the Columbia River", published in 1832, about his adventures on the Columbia River, including a stay in Astoria (Fort George) in May and June 1812. 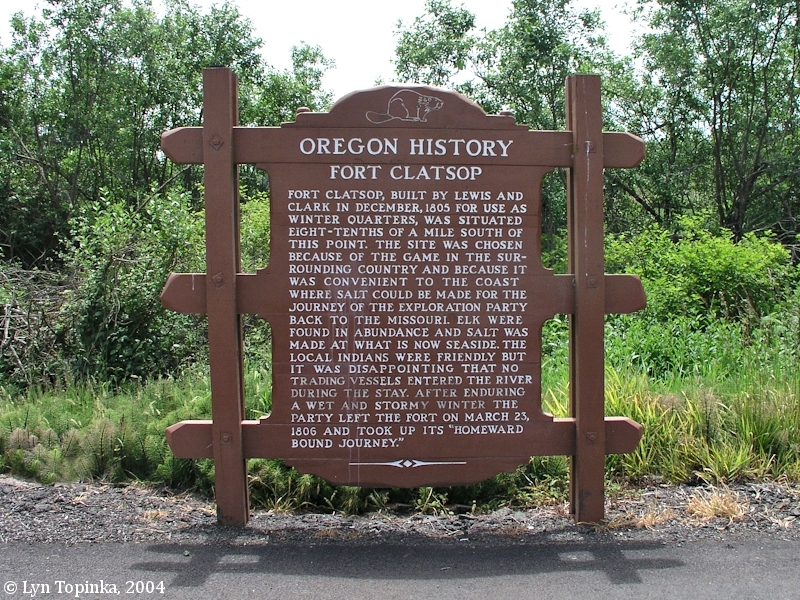 "... A Congressional committee, reporting on the occupation of the Oregon Country in 1821, noted that according to information then available in Washington, the remains of Fort Clatsop were "yet to be seen". ..."
Naturalist John Kirk Townsend wrote about Fort Clatsop in his journal in 1836. He also makes mention of one of the Jefferson Peace Medals. "October 14th. -- I walked to-day around the beach to the foot of Young's bay, a distance of about ten miles, to see the remains of the house in which Lewis and Clark's party resided during the winter which they spent here. The logs of which it is composed, are still perfect, but the roof of bark has disappeared, and the whole vicinity is overgrown with thorn and wild currant bushes. One of Mr. Birnie's children found, a few days since, a large silver medal, which had been brought here by Lewis and Clark, and had probably been presented to some chief, who lost it. On one side was a head, with the name "Th. Jefferson, President of the United States, 1801". On the other, two hands interlocked, surmounted by a pipe and tomahawk; and above the words, "Peace and Friendship". ..."
"... The Columbia, opposite to Astoria, is four miles wide, but in the middle of the river is an extensive sand-bar, with only a few feet water on it, and at extreme low tides it is bare: the channel is very narrow on each side and difficult to navigate. At Astoria there is only space for a dozen vessels to lie at anchor, and it would therefore be difficult to accommodate any extensive trade. 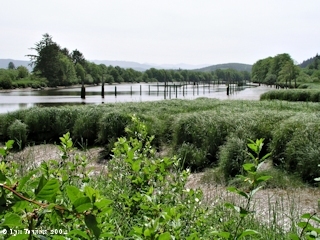 The point of land extends about half a mile below its site, where Young's river joins the Columbia, and forms a bay, on the banks of which Lewis and Clarke wintered. The position of their hut is still pointed out, but the building has long since gone to decay. ..."
"... An American missionary who saw the site in 1842 reported that Lewis and Clark's "hut had entirely disappeared," but Indians pointed out to him the trail used by the explorers during their journeys from the fort to the seacoast. ..."
"... Another settler, James Harrell, who visited the scene of the encampment in 1848 later recalled that he saw the foundations of a single building, about 16 feet by 16 feet and 4 logs high. ..."
"A newly discovered map may help solve one of the great mysteries associated with the Lewis and Clark expedition--the exact location of their west-coast encampment, Fort Clatsop. The map was drawn by an unknown member of the 1851 U.S. Coast Survey that mapped the lower Columbia River near Astoria, Ore. ... "Yet within the boundaries of the memorial park, the exact location of the fort is not known," Byram explains. Why? No maps of the fort exist that were drawn by members of the Lewis and Clark expedition. In fact, before Byram's map, historic records reported the location of the encampment somewhere between one-and-one-half and four miles from the mouth of the Lewis and Clark River. Homesteader recollections of the fort ruins recorded at the turn of the century by the Oregon Historical Society point to a general location, but provide conflicting information about the specific site. Compounding the problem is uncertainty about river changes in the past 200 years. 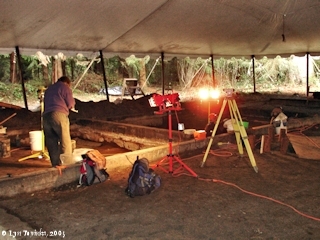 Archaeological excavations in 1948, 1956, 1957 and 1961, as well as the present Fort Clatsop Project, failed to find a definitive location. Byram's map, which remains well preserved after nearly 150 years in the U.S. Coast Survey archives, will provide researchers with valuable new information. For example, the fort (or "hut" as it is labeled on the map) is shown at the very edge of a slope, which descends toward the river's flood plain. The fort's shape and orientation are also suggested by the small square used to mark the structure. ..."
"... Late in 1899 the Oregon Historical Society resolved to identify the site of Fort Clatsop for the purpose of erecting a monument thereon. As a result, two members of the Society's Committee on Memorials, L. B. Cox and William Galloway, visited the traditional locations on June 8, 1900. With them was a small group of early settlers who knew the vicinity well. They were Silas B. Smith of Warrenton, who had assisted Wheeler the previous year; Preston W. Gillette, a "well-known pioneer," formerly of Clatsop County; and Carlos W. Shane of Vancouver, who once had lived on the fort site. Reaching the old Seaside landing by boat, the party, guided by Shane and Gillette, climbed up to the benchland above--where Wheeler had marked out his conjectural fort outline--and began to look for familiar landmarks. Although Gillette later claimed the larger the credit for identifying the site, Carlos W. Shane probably gave the most telling evidence. In a deposition made a week later, Shane recounted the facts he must have presented on the ground: ..."
"... I came to Oregon in 1846, and in 1850 I located a donation land claim on a tract of land which included the site of Fort Clatsop; I built a house on the land in 1851 and occupied it until 1853. A few feet from where I built my house there were at that time the remains of two of the Lewis and Clark cabins . They lay east and west, parallel with each other; and ten or fifteen feet apart. Each cabin was sixteen by thirty feet; Three rounds of the south cabin and two rounds of the north cabin were then standing. 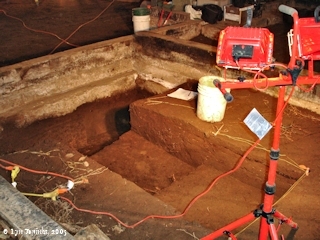 In the south cabin stood the remains of a large stump. The location of the old stockade was indicated by second growth timber, while all around it was the original growth, or the stumps of trees which had been cut. In clearing away for my house I set fire to the remains of the old cabins and endeavored to burn them. ..."
"... In October, 1853, . . . I visited the site of Fort Clatsop and saw a section of two logs, each eight or ten feet long, crossed at right angles, which had manifestly been the foundation logs of one of the Lewis and Clark cabins. The ends of the logs were charred, showing that they had been burned. The extent of the stockade was shown by the fact that its site was covered with second growth timber, while all around it stood the trees of the original growth, or the stumps of such as had been cut. Carlos W. Shane sold his place to his brother, Frankland Shane, in 1853, and the latter was occupying it at the time of my visit. I sold Frank Shane some fruit trees, which he planted in the rear of his house. Three of those trees are now standing. Richard M. Moore had in the year 1852 located a donation land claim just south of Carlos W. Shane's and built a house a few feet south of the division line, almost on a line with and but a short distance from the Shane house. This house has since disappeared, but it stood immediately at the head of a little draw in the hill leading down to the river, which draw is now plainly to be seen . . . . When I first knew this spot the trail cut by Lewis and Clark through the timber to the ocean was plainly visible, it having been kept open by the Indians and elk, and it continued as a traveled passage for some fifteen years after my arrival in the county. ..."
"... The prevailing attitude of visitors toward the site is well reflected by a letter written by George Gibbs, a temporary resident of Astoria, to his mother on April 13, 1853. Speaking of Fort Clatsop, Gibbs wrote: "I took a run the other day up the Lewis & Clark's river as it is called to the place of the w[inter] encampment, which long as I have been here I never visited before. The site of their log hut is still visible, the foundation logs rotting where they lay. Their old trail to the coast is just visible being much overgrown with brush . . . Indians are still living who knew them." ..."
"... Several years later Gibbs again described his visit to Fort Clatsop. 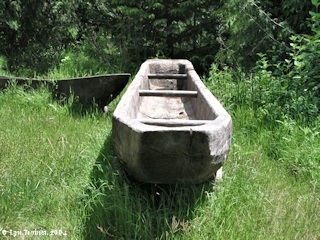 He wrote that the remains were "about" 2 miles from the mouth of the Lewis and Clark River. This remark by a trained and accurate observer tends to confirm the conclusion that the site was at or very near the present historic monument property. ..."
"... After much negotiation, which involved the determination and then one or more re-determinations of the most desirable boundaries, the Oregon Historical Society on September 24, 1901 purchased for $250 a 3-acre tract which contained the site of the Lewis and Clark cabins as pointed out by the pioneer settlers, ..."
"... An analysis of such clues to the location of Fort Clatsop as are given in the original records of the Lewis and Clark Expedition, a study of the long local tradition as to the location of the fort site, and an examination of the available reminiscences and testimony of pioneer settlers who saw the traditional ruins of the fort and pointed out their location--all these lead to the conclusion that in all probability Fort Clatsop stood somewhere within the 3-acre tract purchased by the Oregon Historical Society in 1901. ..."
"... However, since 1901 knowledge of the exact location pointed out by Shane and Gillette seems to have been lost. As far as anyone can prove today, the 50-foot square of the fort could have been located almost anywhere on the approximately 1-1/4 acres of benchland within the tract boundaries. 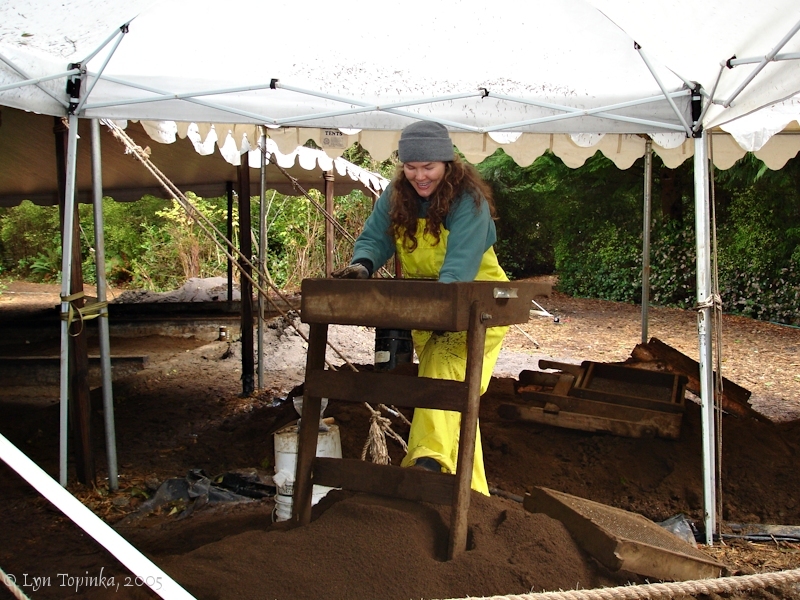 Apparently the only way that the exact site of Fort Clatsop will be determined is by finding some physical remains of the structure. Although the ground on the top of the bluff has been much disturbed by long years of land clearing, agriculture, and domestic habitation, experience at many other frontier post sites has proved that the buried ends of stockade pickets will nearly always survive such treatment. 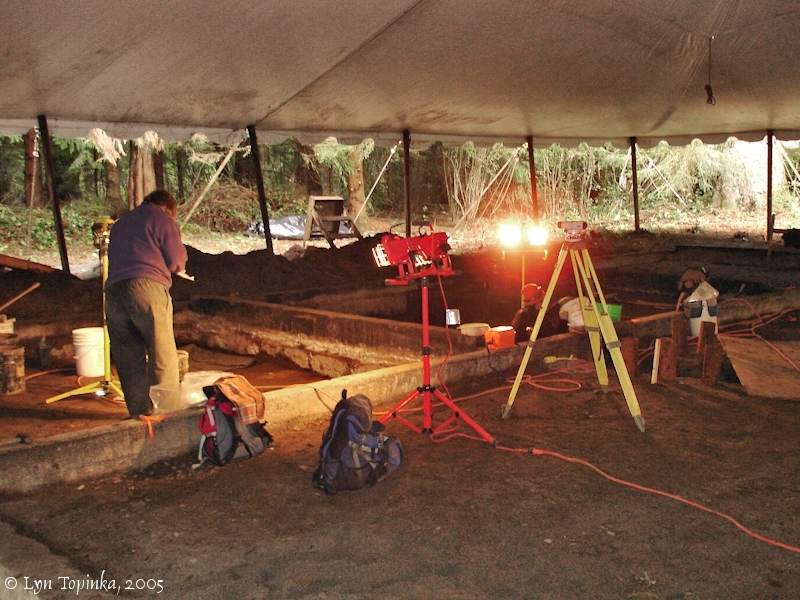 There is hope, therefore, that the actual remains of Fort Clatsop may yet be discovered. ..."
at day light this morning we we[re] awoke by the discharge of the fire arm of all our party & a Selute, Shoute and a Song which the whole party joined in under our windows, after which they retired to their rooms were Chearfull all the morning— after brackfast we divided our Tobacco which amounted to 12 carrots one half of which we gave to the men of the party who used tobacco, and to those who doe not use it we make a present of a handkerchief, The Indians leave us in the evening all the party Snugly fixed in their huts — I recved a presnt of Capt L. of a fleece hosrie Shirt Draws and Socks—, a pr. mockersons of Whitehouse a Small Indian basket of Gutherich, two Dozen white weazils tails of the Indian woman, & Some black root of the Indians before their departure— Drewyer informs me that he Saw a Snake pass across the parth to day. The day proved Showerey wet and disagreeable. we would have Spent this day the nativity of Christ in feasting, had we any thing either to raise our Sperits or even gratify our appetites, our Diner concisted of pore Elk, So much Spoiled that we eate it thro' mear necessity, Some Spoiled pounded fish and a fiew roots. rainy & wet. disagreeable weather. we all moved in to our new Fort, which our officers name Fort Clotsop after the name of the Clotsop nation of Indians who live nearest to us. the party Saluted our officers by each man firing a gun at their quarters at day break this morning. they divided out the last of their tobacco among the men that used and the rest they gave each a Silk hankerchief, as a Christmast gift, to keep us in remembrence of it as we have no ardent Spirits, but are all in good health which we esteem more than all the ardent Spirits in the world. we have nothing to eat but poore Elk meat and no Salt to Season that with but Still keep in good Spirits as we expect this to be the last winter that we will have to pass in this way. Was another cloudy wet day.— This morning we left our camp and moved into our huts. At daybreak all the men paraded and fired a round of small arms, wishing the Commanding Officers a merry Christmas. In the course of the day Capt. Lewis and Capt. Clarke collected what tobacco remained, and divided it amongst those who used tobacco, as Christmas-gift; to the others they gave handkerchiefs in lieu of it. We had no spirituous liquors to elevate our spirits this Christmas; but of this we had but little need, as we were all in very good health. Our living is not very good; meat is in plenty, but of an ordinary quality, as the elk are poor in this part of the country. We have no kind of provisions but meat, and we are without salt to season that.